College students who aspire to earn PhDs often ask themselves if they should proceed directly from undergrad into a PhD program or take a year or more “off” to work. From a career perspective, there are some arguments on either side (and it’s probably field-dependent), though personally I think it’s better to not go straight from college to grad school. However, from a financial perspective, working for at least a year prior to starting grad school is a slam-dunk better choice – provided you handle your salary the right way in the meantime. I’ll assume in this article that you’re earning more in your post-college job than you will as a grad student. I know that’s not always the case (my postbac fellowship paid a stipend comparable to that of a grad student), and if it’s not true for you, simply pick and choose the advice that works for you. This article provides financial arguments for working prior to starting a PhD and gives you a strategy to combat the biggest potential downside to doing so. 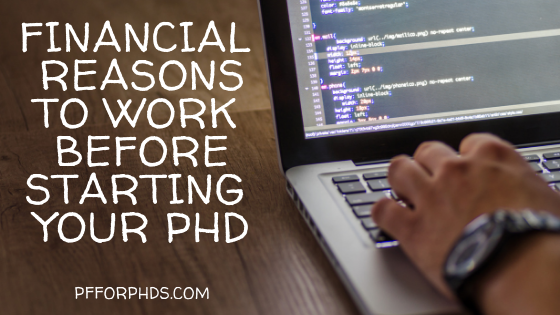 Working before starting a PhD program gives you the best shot at starting grad school (and the rest of your life) on the right financial foot. Those expenses are similar to any that you would incur if you moved for a job, but in addition you have the educationally-related ones and you most likely will wait over one month for your first paycheck to arrive instead of the two weeks to one month typical for a job. If you work prior to starting grad school, you have the opportunity to save for those start-up expenses. If you don’t have enough savings available when you matriculate, you’ll start grad school already feeling financially behind. Starting grad school doesn’t necessarily mean stalling financially, but it is easier to make progress with a salary intended to do more than pay basic living expenses. I already mentioned retirement saving above, but it’s worth emphasizing again. Saving for retirement during grad school is a challenge. This is due primarily to your limited cash flow, but in addition grad students are sometimes disallowed from contributing to any kind of tax-advantaged retirement account due to their income type. If you receive only fellowship income throughout an entire calendar year, you will not be able to contribute to an IRA. It is also exceedingly rare for a grad student to have access to a workplace-based retirement account like a 403(b). Getting an early start on retirement investing will make an enormous difference in your account balances once you reach retirement. For example, if you work for one year until age 23 and contribute $1,000 per month to a retirement account, just that $12,000 contribution alone can grow to approximately $434,000 by the time you are 68 (assuming an 8% average annual rate of return. If you have to slow down or stop retirement investing during grad school, you can still feel good about the investments you already have in place that are working for you in the background. If your employer provides a retirement match, please contribute enough to get the full match! It’s going to be a long time before that opportunity comes around again. Grad school applications can easily cost over $1,000 between the direct application fees and indirect costs like taking the GRE. If you are working when you apply instead of doing it during college, you will have more money (and time) to apply and visit everywhere that is a good fit for you. It would be such a shame for a low budget for applications to constrain your career choices. Side hustling during grad school is a great way to earn some extra income, maintain an identity and emotional outlet separate from your research, and potentially improve your post-PhD career prospects. But when you’re busy with research, classes, and/or teaching, it can be difficult to put in the time and energy needed to get your side hustle off the ground. It’s much easier to maintain a side hustle you established prior to starting grad school (or you could continue some aspect of your job as a side hustle). An ideal side hustle for someone anticipating entering grad school is one that is location-independent and time-flexible. The perfect side income for a grad student is not a “hustle” at all but passive income. Passive income comes in many forms, but requires an up-front investment of time or money to establish the income stream with little to no additional work required on an ongoing basis. In our current low tax environment, I don’t talk about tax planning, that is, changing your behavior due to the tax implications. I don’t like to let the “tail” of tax repercussions wag the “dog” of the rest of your life. However, in this case, I want you to at least be aware of the tax implications of starting a PhD program right away vs. waiting a year or two. There are two big tax effects of having a “student” status (i.e., being a full time student in at least part of five months in the calendar year) and also being young (i.e., 23 or younger on 12/31 of the year in question). Normally, being considered a dependent of your parents expires at age 18, but students can be claimed as dependents up until the year they turn 24. Generally speaking, being claimed as a dependent is bad news for your tax return and good news for your parents’ tax return (or whoever is claiming you). Live apart from your parents for at least six months of the year you finish undergrad (assuming you graduate in the spring) and continue to do so until the year you turn 24 (at least). Wait to start grad school until at least the year in which you turn 24. Provide at least half of your own “support.” Support is basically all your expenses, both living expenses and educational expenses. If you provide at least half of that support through your own income (taxable fellowships and loans count, but scholarships do not), you are independent. This is much easier to accomplish if you earn a higher income and minimize your educational expenses in any year that you are under age 24. The Kiddie Tax is bad news for the “kid” subject to it (that’s you, potentially) as it imposes a much higher tax rate on “unearned” income than what you would have on ordinary income. Weirdly and unfortunately, fellowship income is considered “unearned.” If you are a student, under age 24, and do not provide more than half of your own “support” with ”earned” income, your “unearned” income is subject to this higher tax rate. You do not have to be a dependent for the Kiddie Tax to apply to you. How do you avoid the Kiddie Tax through tax planning? 1) You can wait to start grad school until the year you turn 24. 2) If you start grad school prior to the year you turn 24, make sure you have enough “earned” income in each year you are a student to cover at least half of your own “support.” Keep in mind that “support” includes educational expenses. Have you ever heard the advice to “live like a college student” or “live like a resident?” Take that a step further and “live like a grad student” in your working years prior to starting grad school. Further reading: Is “Live Like a College Student” Good Advice? You will get a head start on the essential financial skills you’ll need during grad school, such as budgeting, frugality, and saving. You will rapidly increase your net worth through saving and/or debt repayment because you will be living far below your means. You will avoid experiencing the very painful process of decreasing your standard of living when you enter grad school. 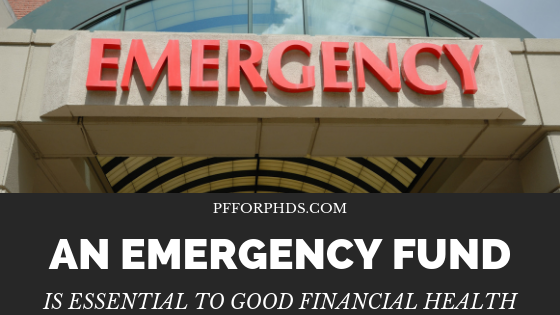 Having a dedicated emergency fund is a vital component of good financial health. An emergency fund is a sum of money set aside to use in case of an emergency. An emergency fund stands between: a) something bad happening in your life and b) something bad happening in your life and there being significant financial consequences. It’s inevitable that sooner or later something bad is going to happen in your life, and the best way to prepare is by saving an emergency fund. The subject of this article is how large that emergency fund should be, when to use it, where to keep it, and how to balance funding it against fulfilling other financial goals. When an emergency occurs in your life, what is the best source of money to draw from to help resolve it? A credit card? A family member or friend? A withdrawal or loan from your investments? A payday loan? • A credit card or payday loan is going to cost you a pretty penny–or an arm and a leg–in interest. • An investment loan or withdrawal unplugs your money from its potential to create a return and sometimes costs even more money in taxes, penalties, or lost contribution room. • A loan or gift from a family member or friend is likely to strain your relationship and could possibly pass on the financial hardship. If you want to contain your financial emergency to the primary event, you’ll save a dedicated emergency fund. Otherwise, the financial emergency could continue to ripple outward into other areas of your finances or relationships. Subscribe to our mailing list (1-2 emails per week) and receive the savings tips as a bonus downloadable PDF. My definition of an emergency expense is one that is fully necessary but that you did not otherwise prepare for. This is a broad net, and qualifying emergencies differ from person to person depending on life circumstances. For example, repairing a car that has become non-functional would be a qualifying expense if: 1) the car served a vital function, e.g., transportation to work when no long-term alternative was available, and 2) the money for the repair was not available from any other cash source. If someone typically drove to work (or some other necessary destination) but other transportation options were available, such as public transportation, biking, carpooling, etc., the repair could be put off until the money could be found from somewhere other than the emergency fund. Similarly, if car repairs were sufficiently saved for in a separate cash account, that expense is not an emergency even if it is a necessary expense. The emergency fund would only be tapped if the expense exceeded the amount of dedicated savings. It is a good idea to save for foreseeable (if not precisely predictable) expenses like car repairs as resources allow. An emergency fund should never be tapped for a discretionary expense. While the existence of an emergency fund is vital for financial health, the exact target size depends on many factors in an individual’s life, such living expenses, competing financial goals, and personal disposition. There may also be a few distinct stages of emergency fund size as you build up to your target fully funded level. The common rule of thumb is that a fully funded emergency fund should contain between three and six months’ worth of living expenses. The rationale behind this figure is primarily for job loss. If you lost your primary income source, how long would it take you to replace it? The average is supposed to be between three and six months. However, you know your particular position and industry best. If your skills are in high demand in your local area, perhaps it would take you very little time to find another position. It’s also easy to imagine that replacing your job could take a very long time if there is a low turnover rate in the position type you seek. Being enrolled in a PhD program further complicates this estimation. Is your funding guaranteed? That doesn’t shrink your necessary emergency fund size to zero, but it may reduce it some. Is funding in your program patchy? That’s a great reason for a larger emergency fund or dedicated savings for underfunded terms. However, if you have other financial goals you want to work on, you may not want to take the time to fully fund an emergency fund from the get-go. For example, in Dave Ramsey’s Baby Steps, you keep your emergency fund size at $1,000 while you pay off all non-mortgage debt. While I’m not necessary advocating this position exactly, it is a good reference point. If part of the objective of an emergency fund is to keep you out of credit card debt, after putting in place a small emergency fund you should work on eliminating any credit card (or similarly high-interest) debt that you have. It makes sense that your emergency fund size should scale with that of your financial footprint, i.e., your spending rate. If you spend very little money each month to keep your life running, you can get away with a smaller emergency fund. For example, if your household is only your or only you and another working adult (no dependents), you don’t own your home, you don’t own a car, and you generally don’t have many necessary expenses, your emergency fund can be on the smaller size. Conversely, if you own a home and one or more cars, have dependents, and spend a lot to keep your life running, you need a larger emergency fund. In the case of job loss, your emergency fund of ideally several months of expenses would keep your household running until you can secure another position. However, other types of emergencies can arise, often relating to your possessions or the people in your household, e.g., illness, home or auto repairs, electronics replacement, etc. The more people and possessions involved, the more likely an emergency is to occur or even multiple emergencies at once. Emergency fund building is not the only worthwhile financial goal you could pursue. There is also debt repayment, investing, and cash saving for other purposes. After building a small emergency fund (e.g., $1,000 or a few thousand dollars), you should pay off any high interest rate debt before choosing your next financial goal. Cash saving, investing, and moderate-interest debt repayment all rank alongside finishing building your emergency fund, so it’s up to each individual to decide which is most important. Realistically, in the case of a large emergency, any regular saving/investing/debt repayment rate could be redirected to the emergency need. Therefore, generating a high monthly savings rate itself is a worthy pursuit, and which goal exactly you fund with the savings rate is less material. It’s a fine choice to split your efforts between continuing to build your emergency fund/cash savings and investing/repaying debt. Your personal disposition toward risk comes into play when deciding emergency fund size. This is an emotional or gut feeling issue rather than a logical or mathematical one. If you sleep better with a larger emergency fund, go that route! If you are not risk-averse regarding emergencies, keep a smaller (but non-zero) emergency fund. Your full emergency fund size is an incredibly individual decision based on your living expenses, competing financial goals, and disposition. You may also go through transitions in your emergency fund size: an initial smaller amount, gradual growth toward your full goal size, and fluctuations up and down as the fund is tapped and refilled. Your emergency fund should be kept in cash-equivalents (or cash, partially). Cash-equivalents include checking, saving, and money market accounts. The best solution for most people is to have a separate savings account dedicated as an emergency fund at the same bank where you hold your primary checking account. This allows for a clear distinction between regular and emergency funds while still keeping easy access in case the money is needed. Some people may be able to keep their emergency fund in their primary checking account, but this method requires great discipline to keep from dipping into the fund for non-emergency purposes. If you are inclined to inappropriately use your emergency savings, you could try keeping it at a separate bank from your primary checking (e.g., an online-only bank that pays higher interest rates). The delay in transfer time between the banks would discourage casual usage of the fund. Can I Invest My Emergency Fund? Some people desire to invest their emergency savings to try to make their money work for them and get a rate of return on it. For example, a popular place to stash emergency savings is in investments inside a Roth IRA because the contributions are able to be withdrawn at any time. If you are truly wealthy and have lots of cash and accessible investments, go ahead and invest your ‘emergency fund’, i.e., part of your savings. But if you’re just starting out, don’t risk your safety net for a few extra bucks. It’s not feasible to directly mathematically compare the goal of filling an emergency fund with other financial goals like investing or debt repayment. Investing and debt repayment ‘make’ you money, while an emergency fund ideally just sits there at the ready for you. Anything you do to improve the asset side of your balance sheet is going to strengthen your financial position in the case of an emergency. (Debt repayment, while good for your balance sheet and eventually cash flow, does not strengthen your position in the case of an emergency unless you pay off one or more debts completely.) Cash savings are especially helpful, whether you call them emergency savings or something else. The more necessary expenses that you prepare for with cash savings, the narrower your definition of an emergency becomes, which makes it easier to keep a smaller emergency fund. When you have low discretionary cash flow (total income minus necessary expenses), like during graduate school or your postdoc, it is more important to have a dedicated emergency fund. This is doubly true if you have a low amount of other available assets like cash and investments. Unfortunately, having low discretionary cash flow means that it is going to be difficult to build up significant cash savings in an emergency fund. In this case, you should move on to investing or debt repayment after working on the emergency fund for several months or a year. If you ever do need to tap your emergency fund, refilling it should become your top financial priority. While emergency funds are unique to each individual, you may use the following example as a model that you can tweak to your own purposes. At his starting point, Andrew has no cash savings and some debt; he is living paycheck to paycheck. He works on increasing his income and/or decreasing his expenses so that he can start regularly saving. His first goal is an emergency fund of $1,000. Once he achieves that, he turns his attention to repaying his high interest rate debt (> 10%). Then he returns to building his emergency fund to $3,000, which is approximately two months of expenses. Now that his high interest rate debt is paid off, Andrew increases his savings rate even further. He would like to start investing alongside continuing to build up his cash savings, so he send half of his available savings rate into a Roth IRA and half goes into cash savings for irregular expenses. He considers the irregular expenses account full when he reaches $5,000. Finally, Andrew switches his cash savings back to filling his emergency fund to what he considers a full size, 3 months of expenses. After that, he puts his full available savings rate toward his investments.